No one will ever confuse the S2 9.2 - in particular the Center cockpit model - with a modern-day racing machine. That said, she is a fine performer, and is more than capable of some impressive performance. I have raced on many boats, from Lasers to 12 meters, in both short course and offshore races, and have learned a lot about getting the most out of the 9.2, with surprisingly little effort. Since very few people race the 9.2, each headsail is cut differently and there's no "one size fits all" approach to trim. I usually set the jib leads for the average wind expected for a day and leave them there most of the season, only adjusting if I'm going out in really light or really heavy air. 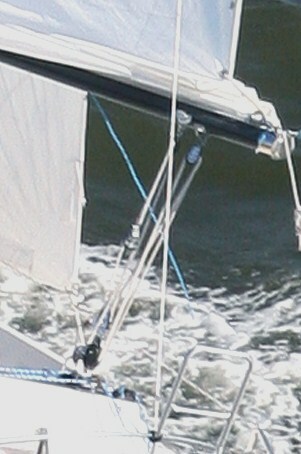 One observation I often make on people sailing cruising boats upwind is the jib is never trimmed in enough for upwind. Depending on the cut of the jib, and even though it's sheeted to the toe rail, there are times when I've had the jib trimmed inside of the lifelines. My current #1, a North Norlam 155%, gets close to the lifelines but stays outside. Once the jib lead is set correctly (so that the upper inside telltale breaks just before the lowers), my base jib trim is 6-8" off the spreadertip. In lighter air it will be fuller, in heavier air tighter. 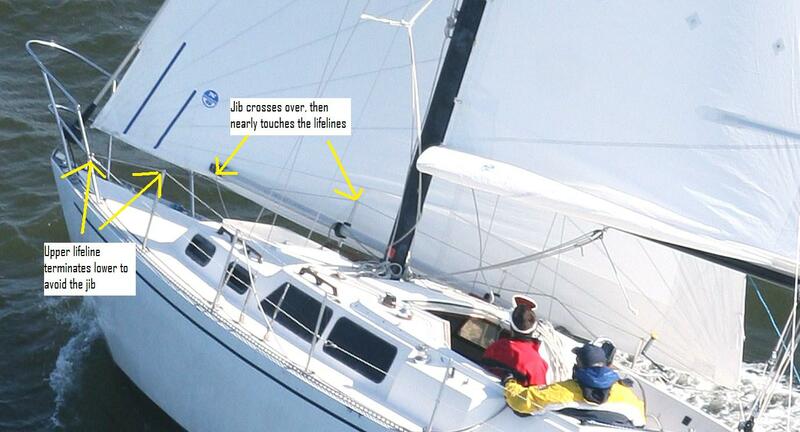 If you look at this picture from the '06 Harbor Cup, you can see the jib almost touching the lifelines. One additional area for observation: Between the forward-most lifeline and the bow rail, I drop the top lifeline to the mid attachment point. By the time you're walking forward to the bow I find I'm usually on my knees anyway, so the loss of 8" of lifeline height isn't that critical. But it does prevent a lot of chafe along the bottom edge of the headsail, and gives it a cleaner shape overall. Gear: The original Lewmar 25s make for a real workout bringing the genoa in in a stiff breeze. If upgrading isn't in your budget (thus far I've replaced one with a Harken ST32), there are two cheaper items that help. First is some form of two-handed winch handle - I use a Lewmar Powergrip, but find what works for you. The second is upgrade the genoa turning blocks to the biggest you can find - not the strongest, but physically the ones with the largest diameter. I originally tried smaller (but well within the breaking strength) blocks, but because of the 140 degree turn there's a lot of friction. Upgrading to bigger diameter blocks made grinding much easier. The 9.2 is incredibly sensitive to main trim. As a drill occasionally I'll lock down the wheel and steer through a field of crab pots using only main trim - sheet in to head up, ease out to fall off. If you still have the original pin-stop traveller (you'll know what I'm talking about if you do), replacing it with a more modern traveller is definitely worth the $3-600 and 4 hour investment. The second improvement is to convert the mainsheet from a single-speed 6:1 to a two-speed 6:1 or 24:1. For this upgrade, I took a smaller-diameter line with a 4:1 purchase and inserted it between the becket on the mainsheet cleat and the fixed end of the sheet. For normal trim, everything remains the same as before. Upwind, though, you can make smaller adjustments with less force using the 4:1 tackle - giving you 24:1 on the mainsheet as a whole. Since most people don't sail the S2 9.2 with a full crew on the rail, she's fairly sensitive to heel, and like most boats prefers to sail upright. The first adjustment is the traveller - in a puff, ease the traveller down. In heavy wind, if the traveller's all the way down and you're still overpowered, change down or reef. The outhaul is, like the jib leads, something I don't adjust frequently. Unfortunately, it's just not an easy adjustment on the 9.2, so set it for the average wind condition in your area. If you'll be sailing in heavier wind, by all means pull it in more. Similarly, ease it out in lighter air. Since each main is different, where you ease or tighten from is just personal experience. My upwind sailplan right now is a #1, #3, blade, #4, storm jib. The 9.2 would definitely like a #2 - almost to the point where I wish the sail I'd purchased in '05 was a #2 instead of the #1. By 14 knots, the full main and #1 are overpowered. 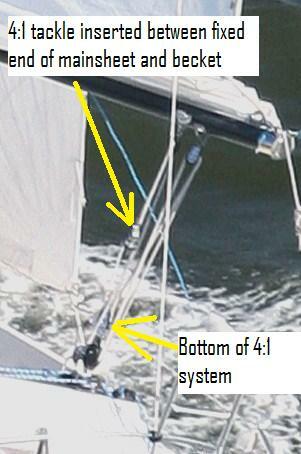 Since she's definitely underpowered with the #3, I'll often reef the main and keep the full headsail exposed. Obviously rolling up the headsail is an option, but I tend to prefer the cleaner shape of the full genoa. This is the page called "Performance," after all - realistically most people will just roll part of the genoa. By 18 knots sustained, I'm definitely in the #3 range, though I may have the full main out. If you're trying to sail upwind in 20+, I would definitely recommend changing down to a smaller headsail over rolling a #1. It's miserable enough slamming into waves, you don't need to lengthen the journey by sailing at 50 degrees to the wind when you could be doing 43. The 9.2 is a blast to reach. During the Frigid Digit series in October '04, we accidentally unreefed the main on the downwind leg of a box course - someone had changed the wind instrument to read apparent, and 12 knots seemed like we needed the full main back up. On the following reach in 20 knots true, with each gust Bay Retriever buried her shoulder, accelerated, and just took off. We passed two boats on that leg. Unfortunately, the race finished upwind, and we were slip sliding away, as grossly overpowered as we were. The vang is an important speed control, so if you do get overpowered be sure to ease it. Inspect your steering system. Probably as a result of that race, the main turning block at the base of the hull - where the steering cables turn aft, having come down from the pedestal - worked loose and needed to be reglassed. The loads on the wheel were tremendous, but I never felt like I was losing control. If you find out how to get the 9.2 to perform well downwind let me know. This is the one area of racing where I've struggled with her. As promised, here's data primarily from the US Sailing IMS certificate for a 9.2A, modified by my observations. The 9.2C routinely hits or exceeds the upwind numbers. Downwind - well, I rarely get a chance to sail downwind with a crew comfortable with a spinnaker.